Gothtober Day 11 Cash 4 Organs!!! artists Comments Off on Gothtober Day 11 Cash 4 Organs!!! 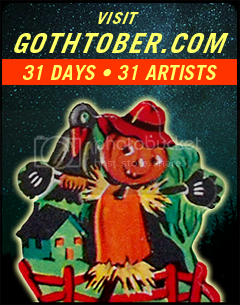 Visit www.gothtober.com and click on DAY 11 to find out more about Cash4Organs! Today’s gothtober day was proudly sponsored by Cash4Organs.com, the premier organ sales site. Surely you have an extra kidney, lung, or eye laying about. So do Millions of Americans! Maybe you are already an organ recipient and don’t need it anymore. Maybe it has sentimental value but you won’t ever need that kidney. Wouldn’t you like to get cash for that organ? Cash4Organs.com is the original online organ buyer. We’ll give you CASH for your organs. Our process is Secure. Fast. Find out more about Day 11 here!